At 3:12 p.m. today, Wednesday, Feb. 13, Natchitoches Parish Sheriff’s Deputies and Natchitoches Parish Corrections Division Officers captured Randall Dale Perot who escapted from a work detail this morning at approximately 10 a.m.
NPSO thanks the Louisiana State Police, Winn Parish Tracking Team, Sabine Parish Sheriff’s Office, US Forest Service Law Enforcement and all deputies and volunteers that took part in the capture of Perot. 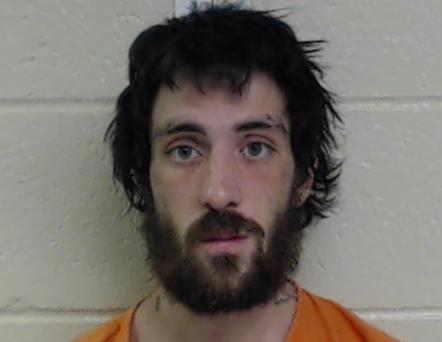 Natchitoches Parish Sheriff’s Deputies, Natchitoches Parish Sheriff’s Corrections Division, and Louisiana State Police are searching for an escaped work crew inmate on La. Hwy 117 near the Kisatchie Work Center north of Kisatchie according to Natchitoches Parish Sheriff Victor Jones. According to Chief of Corrections, law enforcement authorities are actively searching for Randall Lee Perot, 27, w/m, Hgt/503, Wgt/115 with long brown hair and brown eyes last seen wearing denim jeans and a blue shirt. Perot has a tattoo of a Louisiana Boot with “318” on the left side of his neck. At approximately 10:30 a.m. this morning, Wednesday, Feb. 13, Perot was working on a supervised work crew in the Kisatchie area when he apparently left the work site, stole a US Forest vehicle then crashed it a short distance away. Natchitoches Parish Sheriff’s Deputies, Corrections Division Officers, Louisiana State Police, Winn Parish K-9 Tracking Team, US Forest Service Law Enforcement Agents and Sabine Parish Sheriff’s Deputies are currently searching the area with all-terrain vehicles and dogs. Louisiana State Police Air Support is en route to assist with an aerial search. Perot was serving DOC time until 2025 for Illegal Possession of Things and Illegal Possession of a Firearm by a Person Convicted of a Felony.